Radiofrequency ablation has developed as a treatment for osteoid osteoma in proximal femoral neck region; however, anterior hip arthrotomy, enbloc excision and prophylactic fixation may be a reasonable option. 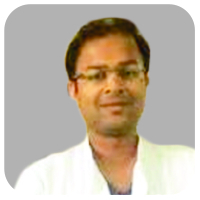 Pediatric Orthopedics Consultant , Deeher Children Orthopedic Clinic, Jaipur, Rajasthan, India. Department of Pediatric Orthopedics, Shalby Hospital, Jaipur, Rajasthan. India. 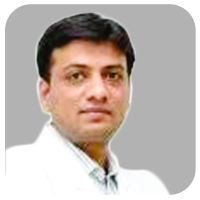 Pediatric Orthopedics Consultant, Deeher Children Orthopedic Clinic, Jaipur – 3020018, Rajasthan, India. Introduction: Proximal femur is the common site for localization of benign bone lesions, and the diagnosis is often delayed and potentially challenging due to their atypical presentations. Early diagnosis is difficult as intra-articular lesions often present with clinical and radiological features of inflammatory synovitis in the joint. Case Report: Two patients of intra-articular osteoid osteoma in proximal femoral presented with atypical features limb lengthening, minimal reactive bone sclerosis, and multifocal nidus. They were managed with anterior open approach, en bloc resection of the lesion, placement of autologous cortical graft, and prophylactic fixation with dynamic hip screw. Conclusion: Intra-articular osteoid osteomas in proximal femoral neck present differently, making the diagnosis and treatment challenging. Anterior open approach, en bloc resection of the lesion, reinforcement, and prophylactic fixation with dynamic hip screw is a reasonable option for managing these lesions which can be easily done in an average clinical setup. Keywords: Osteoid osteoma, Proximal femur, Excision. Proximal femur is the common site for localization of benign bone lesions, and the diagnosis is often delayed and potentially challenging due to their atypical presentations . Early diagnosis is difficult as intra-articular lesions often present with clinical and radiological features of inflammatory synovitis in the joint. These can be detected incidentally and frequently are “leave-me-alone” lesions, which cause few clinical symptoms; however, osteoblastic benign bone lesions like osteoid osteoma may present with recurrent pain and abnormal gait patterns making surgical treatment necessary for such cases. Osteolytic lesions in proximal femur raise a higher concern for pathological fractures due to stress on weight-bearing anatomical site, thus surgical intervention is preferred . Various surgical options have been reported for approaching benign tumors or tumor-like lesions in the proximal femur neck, ranging from simple decompression to complex procedures . Minimally invasive surgery using drilling and thermo/radiofrequency ablation adds to the cost of the treatment and makes it more technically demanding surgery . In developing countries, where newer medical technologies are not available, open procedures for directly visualizing the lesion and en bloc resection, bone grafting with prophylactic fixation are indicated. Involvement of proximal femur in osteoid osteoma seems to be associated with higher risk of complications when treated by minimal invasive surgical techniques . We report our experience of two cases of osteoid osteoma in proximal femoral neck treated with anterior open approach, en bloc resection of the lesion, placement of autologouscortical graft, and prophylactic fixation with dynamic hip screw. A 20-year-old male presented to us with pain in the right hip for 1 year with gradually developing limp over a period of 2 months. Initially, the pain was mild in intensity which gradually progressed to moderate intensity within a period of 1 year. Now, pain is continuous in nature, interfering with activities of daily living and relieved by taking pain medication. Since past 2 months, he noticed limp, which was progressive and associated with pain. He has been taking pain medication intermittently for past 1 year. He even took antitubercular treatment for 2 months which he stopped on its own. Previous magnetic resonance imaging scan reported synovial effusion with altered signal intensity at anteroinferior aspect of the right femoral head. He was diagnosed with monoarticular juvenile rheumatoid arthritis and referred to our center. Physical examination revealed tenderness in anterior aspect of hip joint. Movements were terminally restricted due to pain. Blood count and biochemical profile are within normal range. Careful evaluation of radiographs showed sclerosis in anteromedial aspect of femoral neck with nidus surrounded by radiolucent rim suggestive of osteoid osteoma (Fig. 1).Computed tomography (CT) scan clearly shows a small eccentric lytic lesion in inferomedial aspect of the right femoral head with subtle cortical breach and reactive bone sclerosis (Fig. 2). An en blocopen surgical resection of the lesion was planned under guidance of image intensifier. Procedurewas done in supine position. Standard anterior Smith Peterson approach was used for the exposure of formal neck. Inferomedial part of femoral neck was clearly seen on abducting and external rotating the hip. Lesion was localized and marked using image intensifier. Drill holes were made along the margin of the lesion. A large chunk of abnormal bone was osteotomized and removed. Complete excision of the lesion was confirmed. Size of the defect created was measured. Slightly oversized tricortical bone graft was taken from the ipsilateral iliac crestand impacted into the void with cortical surfaces facing outside. The graft was quite stable and does not require any additional fixation. Since the bone was removed from inferomedial aspect of femoralneck; to prevent fracture prophylactic fixation was done using dynamic hip screw and plate from a separate lateral incision. Excised bone was sent for histological examination. Patient has significant pain relief immediately postsurgery. The limb was non-weight-bearing for 2 weeks, followed by gradual weight-bearing with crutches as tolerated over a period of next 4 weeks. Patient returned to his previous activities of daily living after 2 months. The pathology report shows fibrous dysplasia, which the authors were not convinced with. Hence, it was decided to send the tissue and slides for repeat histological examination at another laboratory, which revealed multi nidi osteoid osteoma. Diagnosis of atypical osteoid osteoma was established after discussing with the pathologist. Follow-up at the end of 1 year did not show the presence of any residual symptoms or recurrences. Radiograph shows good consolidation of the graft with implant well in place (Fig. 3). Patient regained full motion in the hip and was able to do squatting and cross-legged sitting comfortably (Fig. 4). 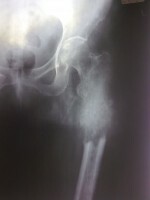 A 12-year-old adolescent male presented with 10 months history of pain in the right hip radiating down to anterior thigh. Initially, pain was intermittent in nature which gradually progressed over a period of time, limiting daily activities. Patient has been treated conservatively with oral antibiotics and anti-inflammatory drugs for past 2 months. He now often wakes up at night due to pain in the right groin. Parents noticed occasional limp for past 1.5 months. Movements in hip were terminally restricted with lengthening of affected limb by 1 cm. Radiographs showed dense sclerosis in the inferomedial aspect of the right femoral neck with broadening (Fig. 5). CT scan revealed eccentric lytic lesion with reactive bone sclerosis. 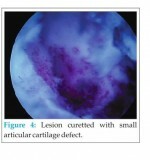 Based on imaging studies, working diagnosis of osteoid osteoma was established. 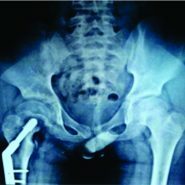 Lesion was approached anteriorly and excised completely; autologous bone grafting and prophylactic fixation with pediatric dynamic hip screw were done (Fig. 6). The histological examination confirmed the diagnosis of osteoid osteoma. Postoperatively, limb was protected for 3 weeks with gradual weight-bearing as tolerated. Patient’s hip pain completely resolved and remained symptoms free at 6 months of follow-up. He regained full range of motion in hip and normal functional status. These lesions can occur in any bone. However, there is a predilection for the lower extremity with more than half of osteoid osteomas seen in the long bones of lower extremity. It is difficult to estimate the true frequency of intra-articular osteoid osteomas; however, literature suggests an incidence of 0–16% . Intra-articular lesions in proximal femur may be seen with gait disturbances and limp in addition to pain. Being located around hip, they produce synovitis, effusion, stiffness, local temperature, atrophy of surrounding muscles and limitation of range of motion, and mimicking inflammatory synovitis in children and young adults. Lately, they may present with leg length discrepancy due to lengthening of affected limb due to bone overgrowth. Rarely, juxtra-articular lesions, may present with sudden pain and restriction of movements due to perforation of subchondral bone causing intra-articular spillage of the lesion. Clinical symptoms may appear very early as compared to radiographic signs, misleading the physician to a diagnosis of inflammatory arthritis. Widening and foreshortening of femoral neck with reduced height of capital femoral epiphysis can be seen if diagnosisis delayed for more than 3 months . CT is the imaging modality of choice, but magnetic resonance imaging is helpful for evaluating joint effusion, synovitis, and bone marrow. 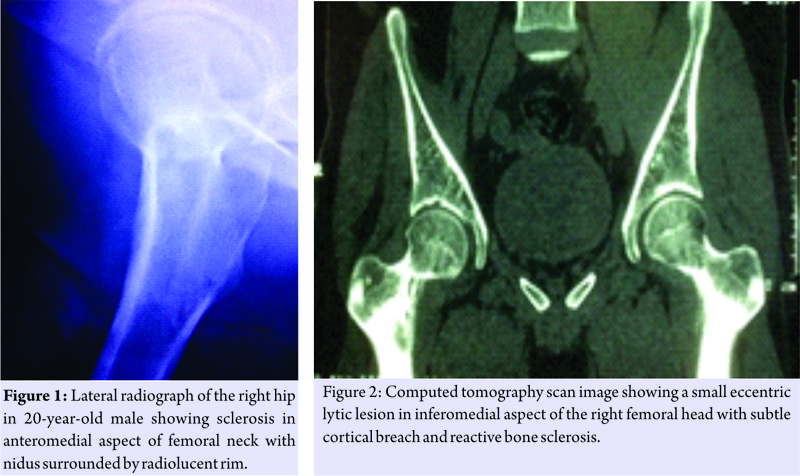 Diagnosis is challenging in cases of atypical clinical and radiographic features, especially with minimal or absent reactive surrounding sclerosis, which is seen in intra-articular and subperiosteal osteoid osteomas. Regional periarticular osteopenia in early stages and periosteal reaction distant from the lesion may be seen. Bone scintigraphy is helpful in such cases demonstrating double-density sign. Positron emission tomography may be useful for diagnosis and post-therapy evaluation. Histologically, nidus is consisted of osteoid and woven bone surrounded by a rim of active osteoblast, osteoclasts, and vascular structures. Sclerosis surrounding the lesion is a reactive response of the host bone to pressure caused by highly vascular nidus, which may be absent or minimal in intra-articular lesions due to the absence of cambium layer of periosteum within the joint. They are usually seen with single nidus, but multi nidi close to each other have been reported with incidence of 1% . One of our cases had multicentric osteoid osteoma which was diagnosed on histology and later on retrospective evaluation of radiographs; we could appreciate two nidi adjacent to each other. Gonzalez et al. have stated that rare incidence of multicentric osteoid osteoma is an underestimation because the multicentricity may be missed . Some believe that multicentricity is a borderline form of osteoid osteoma transforming into osteoblastoma, while other stated that it is an incomplete attempt at healing that resulted in walling off of the first nidus and subsequent development of two nidi . Most non-aggressive, benign lesions in the proximal femur can be treated conservatively. Sink and Bucholzreported a case of intra-articular osteoid osteoma of femoral neck treated non-operatively, but later developed coxa magna . Surgical treatment based on the removal or destruction of the nidus. The location and approach to nidus within the joint makes the treatment challenging. Various treatment modalities such as arthrotomy, arthroscopic removal, and CT-guided RF or laser ablation are available. Minimal invasive surgical approach requires a high-resolution image intensifier with good contrast control, which sometimes may not be available in an average clinical setup. Furthermore, tissue sample obtained in minimally invasive surgery is small, limiting its use in lesions which are well localized and have little diagnostic doubt. These are often associated with complications such as nerve injury, tendinitis, skin burns, broken material, and radiation exposure. Gangi et al. recommended that only typical osteoid osteomas could be treated in percutaneous way . Open approach for proximal femoral neck has been preferred to visualize the complete extent of the lesion. Anterior approach has an added advantage of local tumor control, compared to lateral exposure, as curettage through the lateral window has to travel a long distance contaminating the nearby tissues . Gonzalez et al. recommend en bloc resection over curettage in multicentric osteoid osteoma . Authors have used standard Smith Peterson approach, and the lesion in inferomedial aspect of neck can be easily visualized and approached by abducting and external rotating the leg. After en bloc excision of the lesion, the defect was reinforced with tricortical graft from the iliac crest. Literature recommends surgical reinforcement if the tumor affects more than 50% of the diameter of the femoral neck or affects at least 50% of the bone cortex of the femoral neck . Surgical reinforcement can be achieved with allogenic cortical strut graft, non-vascularized autologous fibular strut, or CHA. Ideal graft material should be osteoinductive, osteoconductive, osteogenic, and easily available. Autologous non-vascularized cortical grafts provide good support at their recipient site . However, revascularization of the graft causes reduction in the biomechanical strength in the first few weeks, which is gradually regained completely by 6–12 months. Hence, authors recommend prophylactic fixation with dynamic hip screw, so as to make patient ambulatory early and prevent further morbidity. Intra-articular osteoid osteomas in proximal femur present differently, making the diagnosis and treatment challenging. They may have atypical features such as limb lengthening, minimal reactive bone sclerosis, and multifocal nidus. Appropriate imaging modality should be adopted to reach diagnosis. Open surgical en bloc resection, reinforcement with tricortical graft and prophylactic fixation with dynamic hip screw is preferred modality of treatment in an average clinical setup. Minimally invasive surgeries have yet to prove their efficacy over open surgical approaches in terms of recurrences and complications. Intra-articular osteoid osteoma in proximal femur may present with vague clinical symptomsmaking the diagnosis challenging. However, CT scan is the investigation of choice. Minimally invasive CT-guided radiofrequency ablation has developed as a standard treatment, but it has its own limitations of advance instrumentation and cost which is difficult to manage in an average clinical setup. We have treated these patients with standard anterior open approach, en bloc resection of the lesion, reinforcement, and prophylactic fixation with easily available dynamic hip screw. We recommend the applicability of this technique for such cases, which is simple and cost-effective. 1. Chai JW, Hong SH, Choi JY, Koh YH, Lee JW, Choi JA, et al. Radiologic diagnosis of osteoid osteoma: From simple to challenging findings. Radiographics 2010;30:737-49. 2. Jaffe KA, Dunham WK. Treatment of benign lesions of the femoral head and neck. Clin Orthop Relat Res 1990;257:134-7. 3. George B, Abudu A, Grimer RJ, Carter SR, Tillman RM. The treatment of benign lesions of the proximal femur with non-vascularised autologous fibular strut grafts. J Bone Joint Surg Br 2008;90:640-51. 4. Hoffmann RT, Jakobs TF, Kubisch CH, Trumm CG, Weber C, Duerr HR, et al. Radiofrequency ablation in the treatment of osteoid osteoma-5-year experience. Eur J Radiol 2010;73:374-9. 5. Raux S, Abelin-Genevois K, Canterino I, Chotel F, Kohler R. Osteoid osteoma of the proximal femur: Treatment by percutaneous bone resection and drilling (PBRD). A report of 44 cases. Orthop Traumatol Surg Res 2014;100:641-5. 6. Allen SD, Saifuddin A. Imaging of intra-articular osteoid osteoma. Clin Radiol 2003;58:845-52. 7. Schlesinger AE, Hernandez RJ. Intracapsular osteoid osteoma of the proximal femur: Findings on plain film and CT. AJR Am J Roentgenol 1990;154:1241-4. 8. Schai P, Friederich N, Krüger A, Jundt G, Herbe E, Buess P. Discrete synchronous multifocal osteoid osteoma of the humerus. Skeletal Radiol 1996;25:667-70. 9. Gonzalez G, Abril JC, Mediero IG, Epeldegui T. Osteoid osteoma with a multicentric nidus. Int Orthop 1996;20:61-3. 10. Zmurko MG, Mott MP, Lucas DR, Hamre MR, Miller PR. Multicentric osteoid osteoma. Orthopedics 2004;27:1294-6. 11. Sink EL, Bucholz RW. Coxa magna in a nonoperatively treated osteoid osteoma of the femoral neck. Orthopedics 2004;27:777-9. 12. Gangi A, Dietemann JL, Gasser B, Mortazavi R, Brunner P, Mourou MY, et al. Interstitial laser photocoagulation of osteoid osteomas with use of CT guidance. Radiology 1997;203:843-8. 13. Hu YC, Lun DX, Zhao SK. Combined anterior and lateral approaches for bone tumors of the femoral neck and head. Orthopedics 2012;35:e628-34. 14. Jaffe KA, Launer EP, Scholl BM. Use of fibular allograft strut in the treatment of benign lesions of the proximal femur. Am J Orthop 2002;31:575-8. 15. Dell PC, Burchardt H, Glowczewski FP Jr. A roentogenographic, biomechanical and histological evaluation of vascularized and non-vascularized segmental fibular canine autographs. J Bone Joint Surg Am 1985;67-A:105-12. 12. Baar J, Burkes RL, Bell R, Blackstein ME, Fernandes B, Langer F. Primary non-Hodgkin’s lymphoma of bone: A clinic-pathological study. Cancer 1994;73:1194-9. 13. Ramadan KM, Shenkier T, Sehn LH, Gascoyne RD, Connors JM. A clinic-pathological retrospective study of 131 patients with primary bone lymphoma: A population-based study of successively treated cohorts from the British Columbia cancer agency. Ann Oncol 2007;18:129-35.